Mr. Brinker attended Washington University where he received an AB degree in 1953, and a JD degree in 1955. 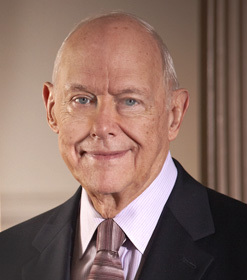 He was licensed to practice law in Missouri in 1955, and in the United States District Court the same year. He has engaged in all types of litigation, tried hundreds of cases and settled countless more. His practice is concentrated in the defense of civil cases including the following areas of law: medical malpractice, product liability, insurance law, automobile, construction, premises liability, defamation, and wrongful death. From the outset his clients have been insurers, their insureds, and self-insured entities. More recently he has focused his practice on mediation, and has mediated several hundred cases. He is certified as a mediator and neutral by the Circuit Courts of the City of St. Louis, St. Louis County, and by the United States District Court Eastern Division of Missouri. A court exhibit in a product liability case, now used as a paperweight. Memories of present and past firm attorneys and partners. Another paperweight used to keep his desk organized.